If the retrospectives are one of the main improvement tools for Agile teams, they can also be the subjects of improvement. In this article, Tom Monico explains how his team has adopted the starfish model to create a better retrospectives process where feedback is produced in real-time and not only at the end of a Scrum sprint. Many have embraced the retrospective while others, possibly most, have a more casual attitude towards the value of the retrospective. Personally, I was somewhere in the middle until my teammates and I developed a better way to learn from the past. We were performing very well. We routinely met our commitments and the business was happy. We held a retrospective at the end of each sprint going around the room asking each team member to share something that worked or didn’t work well. It was a very uncomfortable process for everyone. Since we were doing so well, we questioned the value of the retrospective and considered having the retrospective every other sprint, maybe even less often. Luckily, our desire to have the retro less frequently was short lived. We realized that even though we were doing well, we still needed to challenge ourselves to improve every sprint. If we didn’t, we wouldn’t grow as a team and we’d eventually become complacent about improvement. We needed something better. We needed a better retrospective. 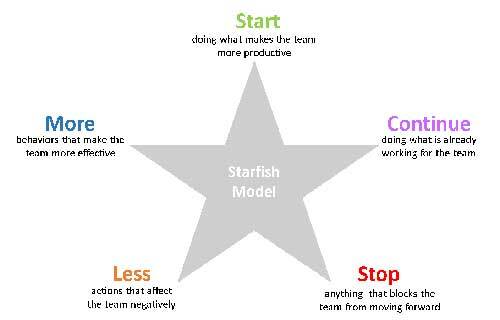 We wanted to make the retrospective as objective as possible so we adopted the starfish model using Start, More, Continue, Less and Stop. This changed our perspective a bit. Instead of sharing problems in the retrospective, we focused on solutions like start something or stop something, etc. In every case, our ideas were focused on actions that we could take to improve. We also changed how we contributed ideas in the retrospective. Instead of going around the table and putting each person on the spot to share something, we took 15 minutes where we all wrote down our ideas and placed them on the board. This was a huge improvement that reduced the pressure on everyone. Our retrospectives were much more fun and effective. Then we wondered, why do we have the retrospective at the end of the sprint. What if we embraced a process of capturing our ideas for improvement in real-time? Our team worked collaboratively in a small open space. We placed a whiteboard that contained the Start, More, Continue, Less and Stop columns and began to add ideas throughout the sprint. Initially, it took some getting used to, but we were convinced that we were on the right track so we persisted. We added cards after the daily, during code reviews, after reviews, whenever we had an idea. When we held our retrospective meeting we already had a board full of ideas to talk about. We continued what we called the “real-time retrospective” for several sprints and with each sprint the real-time posting of ideas became more natural and eventually became the norm. With our success we tried to scale out the real-time retro to other teams. We found that teams that were dispersed within the same office or teams that had remote team members struggled to gain the same real-time momentum that we did. So to make it work for everyone, we took our retro to the cloud. Together we refined the real-time retrospective process and developed an application that made it easy for any team to adopt regardless of their physical location. Also, since we embraced the real-time contribution of ideas, we took a different approach than the classic retrospective. Instead of creating a board for each retrospective, we have a perpetual board for each team. Team members add cards to the online board and at the end of the sprint we meet to discuss the ideas and archive the cards. Having a perpetual board is a subtle difference but it reinforces the real-time culture of our new retro process. So in the end, we built a better retrospective process. It’s fun, engaging and is building a team of everyday innovative thinkers and problem solvers. Today we all agree that the retrospective is the most important part of the agile process. We learn, act and grow every single day. It’s awesome! Tom Monico is a 32-year software development veteran. Tom is passionate about agile improvement and is co-founder of goReflect.com, a tool where teams can conduct retrospectives in real time.